Some progress on this pig of a kit over the past few weeks. The way this thing is ridiculously over engineered is very frustrating. 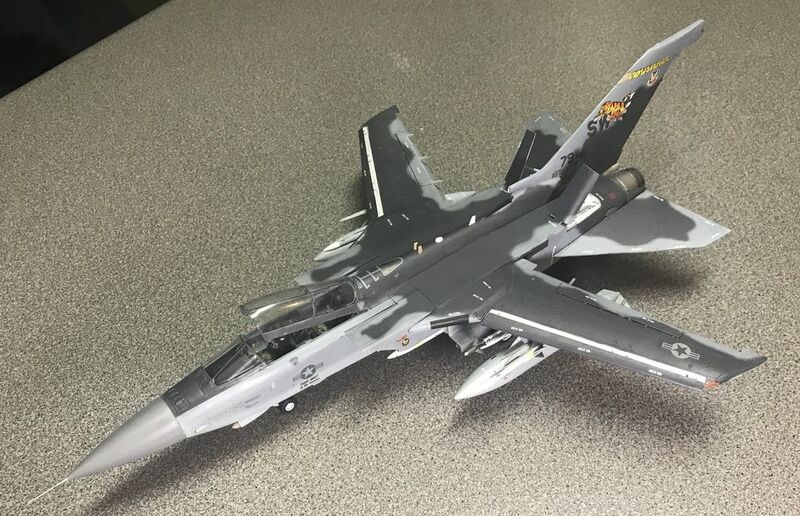 I can't see myself being in a hurry for another Revell 1/48 Tornado. I'll be ready for a nice shake-n-bake Tamiya Corsair or something after this! Various RWR/EW bits n bobs fitted around the nose. 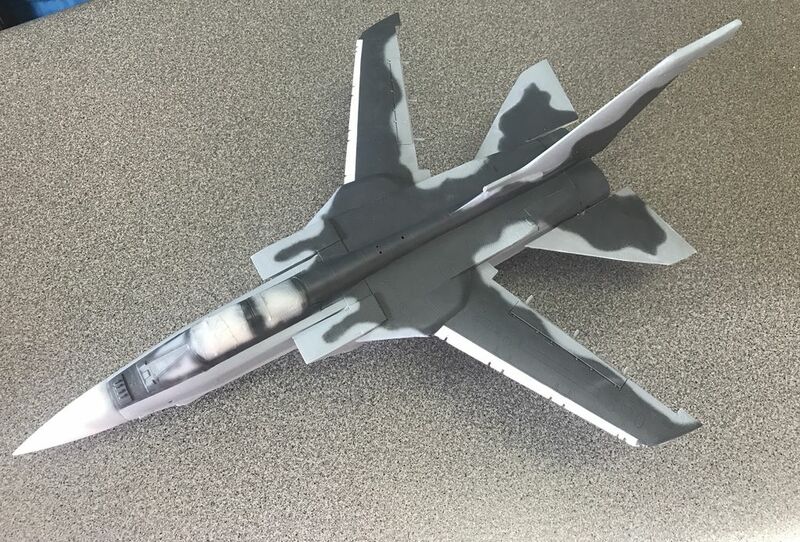 The right front Skyflash/AMRAAM bay has been replaced with an ECM fairing, with the fairing and missile bay containing the internal components of the AN/ALQ-131 pod. I was torn on the paint scheme, leaning from the start towards multi-tone grays for a late 90s example during the NATO Kosovo Campaign. 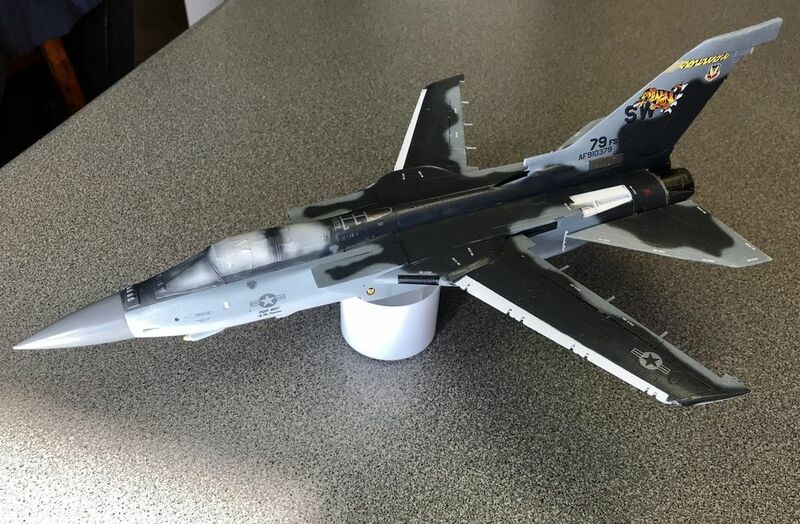 After toying with some of the F-4G and F-16 schemes, I went with my own three tone of Light Ghost Gray, Dark Ghost Gray, and Gunship Gray. I wasn't too sure as I was spraying it, but the more I look at it, the more it's growing on me. 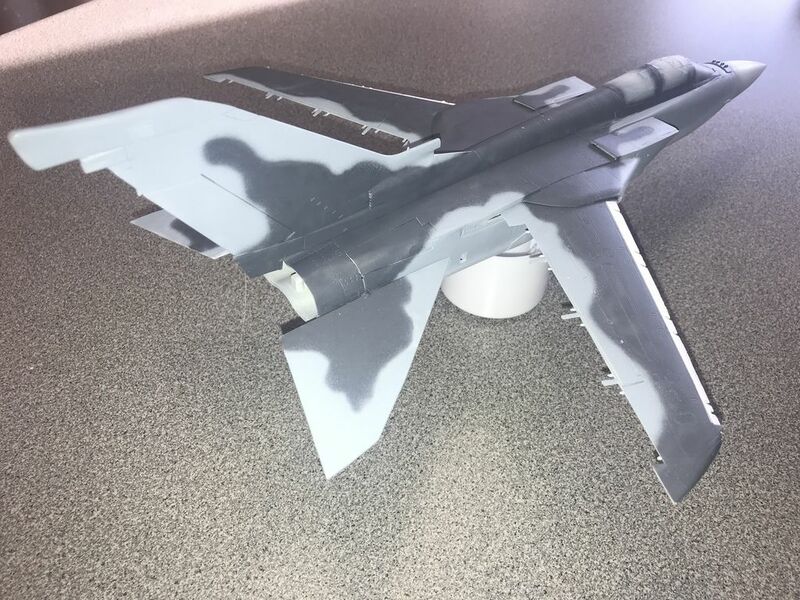 Still need to do some touchup on the horizontal tail, and paint the radome. I'm going to play Devil's Advocate: I'm not really keen on the scheme. HOWEVER, this is not my build & I wouldn't be surprised if you turned this scheme into something I admire before the end of the build. I still think some kind of lizard scheme would have looked better, though. Getting closer to finished. 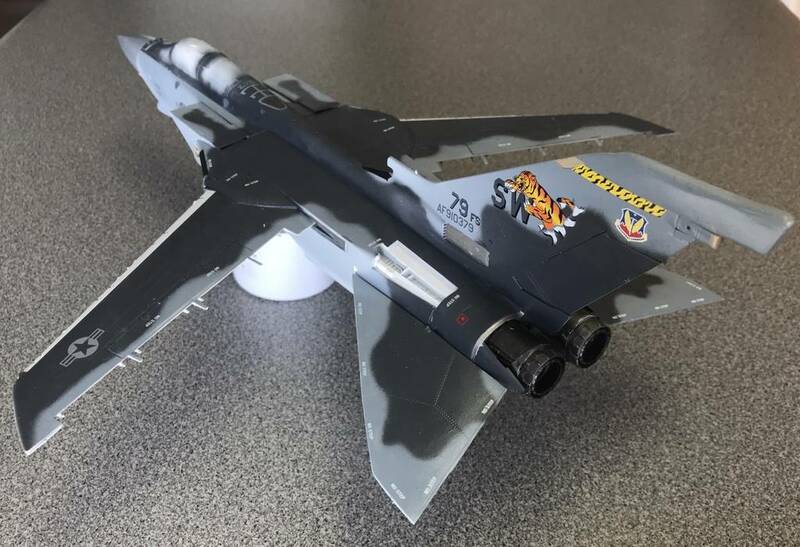 The original plan was for a Spangdahlem Wild Weasel, but my lack of foresight means that the F-16 kit decals I'm using don't work too well on the Gunship Gray tail...so change of plan to something a little closer to home...using the Shaw based Tiger Meet scheme from the F-16 for a little more color. 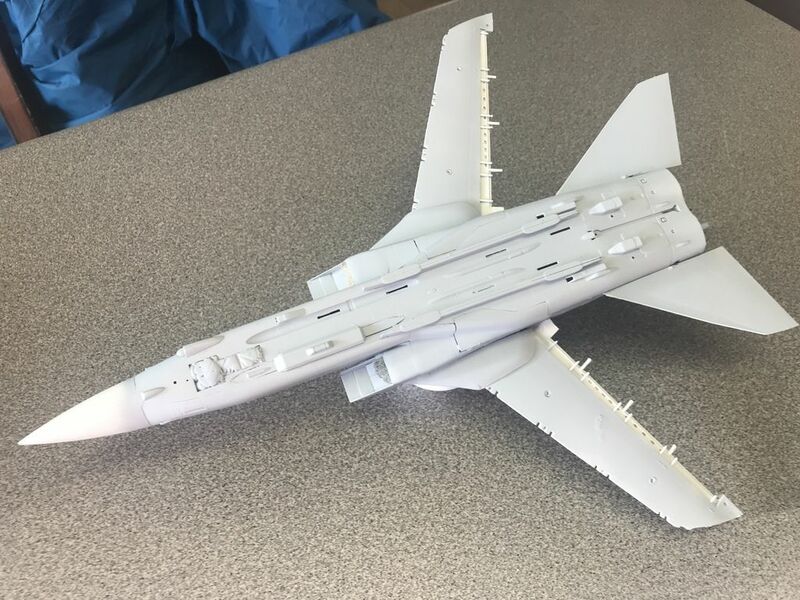 Still needs weathering and the flaps/slats, gear, weapons, tanks, reverser buckets, and various fiddly bits attached, but I see light at the end of the tunnel. You can count me as one who really likes that scheme, and the decals are looking great. I can't wait to see it with the canopy masks off! Later shots look better but still not my favourite. The build, however, is still looking great! Looking forward to the final reveal, Nick. Following the first two modified F.2s, BAe supplies 22 complete "green" F.3 airframes to Rockwell for conversion, before Rockwell assumed production of some components, After the first 24 aircraft US Tornadoes had approximately 60% US content, with the Panavia partners providing some completed components for final assembly. The F-24's engines were license built by Allison as the TF-44, based on the Turbo Union RB.199-104. 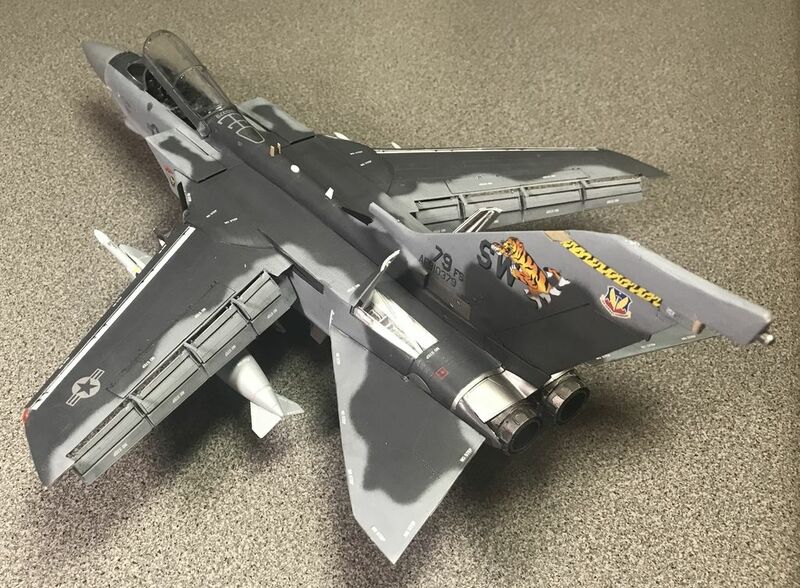 This build represents an 79th Fighter Squadron F-24A in early 2002, still wearing the special markings it wore during the Tiger Meet of the Americas at Buckley AFB in August 2001. By early 2002 the squadron had deployed as part of Operation Southern Watch, patrolling the skies of Iraq as part of the effort to contain the regime of Saddam Hussein. It carries two AGM-88 HARM missiles (the only offensive air-to-ground ordnance carried during Southern Watch) as well as a pair of AIM-120C AMRAAM missiles and a single AIM-9M. It is also equipped with the tail fairing mounted towed decoy system added in early 2000. More pics showing off the HARMs in the next few days. Nick, I think it's an impeccable build of a notoriously challenging kit. Kudos to you, sir, love the 'final reveal' looks just about 'spot on' to my eye.